"How my mom battled cancer while blessing others, leaving a legacy of love. It was an imperfect, broken, yet beautiful shell that you found and kept because there was something about it that had worth. It went through some rough waters, which made it stronger. Even through broken, it was full of intricate patterns, rich with colors that touched countless people who saw it. It washed up on the beach, glistening in the sun where it caught your eye. 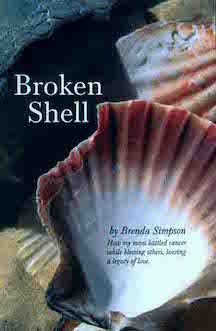 When you picked it up, it left an impression of a perfect shell in the sand."